It’s been cold here in New Hampshire. And by “cold,” I mean take-your-breath-away cold. In fact, if you stay outside for more than a minute, one of your vestigial—but important—parts might freeze off: ears, nose, fingers, toes…. If you’ve ever lived in a cold climate, you know just the kind of cold I am talking about. It is C-O-L-D! The cold sneaks through the walls of the house, around the windows and doors, dancing across the floor as a draft that brings the cold inside. The furnace is struggling to keep the temperature comfortably warm, so we need to bundle up in extra layers, even around the house. Turtlenecks, sweaters, and warm socks are necessary. Back in the days when oversized sweaters were all the rage, I might (or might not) have usurped my dad’s old red wool sweater. I have a vague recollection that he let me borrow it for something when I was a senior in high school, and he decided he wasn’t going to wear it any more anyway (something about it being too small and not really something he was likely to wear), so it became mine. Now, I’m not sure if he really thought he wouldn’t wear it, or he wanted me to have it, but over the years, I have held onto it and worn it every now and again. Each time I sort through clothes to donate, I pass by the sweater, leaving it in the cedar chest just in case I want to wear it someday. It has been almost a year since Dad passed away. The pain of loss was renewed with the holidays and the approaching new year. 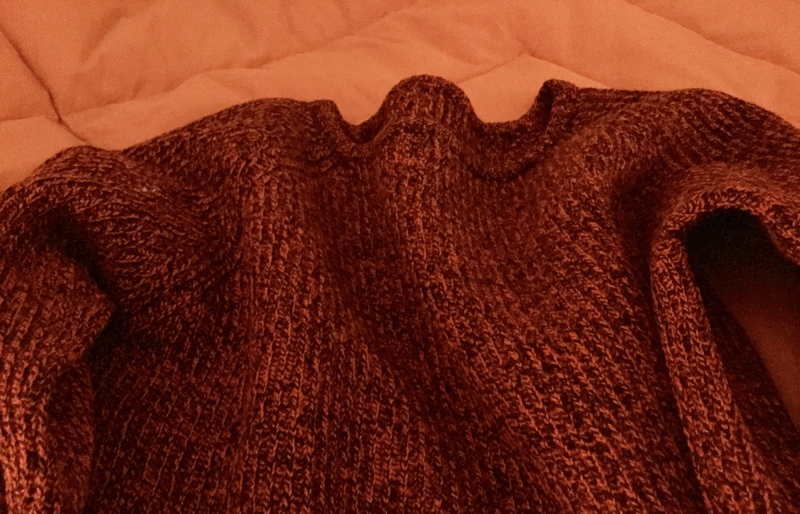 As I looked to bundle up against the cold this morning, I remembered Dad’s sweater, folded and ready for wear at the bottom of the cedar chest. I took it out and put it on, knowing that it was the perfect sweater to keep me warm today. Throughout the day, I cherished both the warmth of the sweater and the feeling of being wrapped in a gentle hug. Since the cold is going to drag on, I think I might wear Dad’s sweater again tomorrow…. The cold weather is dragging on here. It is -4° right now. I think it’s supposed to warm up around the middle of NEXT week….